Researchers have created a new "plasmonic oxide material" that could make possible devices for optical communications that are at least 10 times faster than conventional technologies. In optical communications, laser pulses are used to transmit information along fiber-optic cables for telephone service, the Internet and cable television. 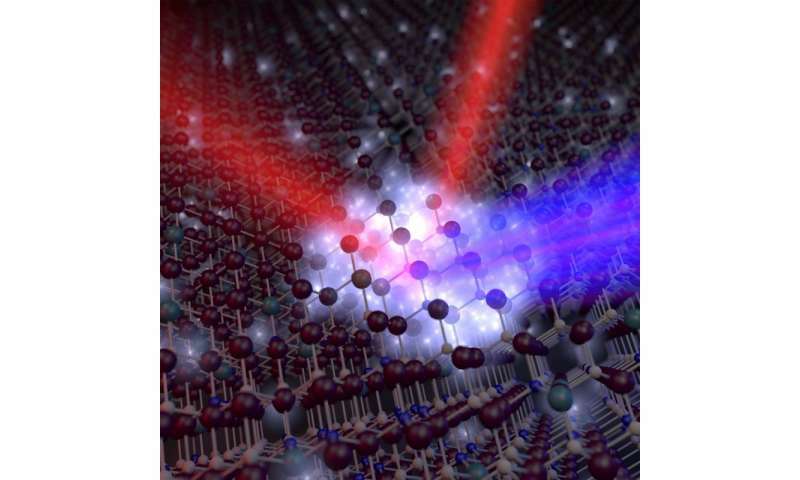 Researchers at Purdue University have shown how an optical material made of aluminum-doped zinc oxide (AZO) is able to modulate – or change – how much light is reflected by 40 percent while requiring less power than other "all-optical" semiconductor devices. "Low power is important because if you want to operate very fast - and we show the potential for up to a terahertz or more - then you need low energy dissipation," said doctoral student Nathaniel Kinsey. "Otherwise, your material would heat up and melt when you start pushing it really fast. All-optical means that unlike conventional technologies we don't use any electrical signals to control the system. Both the data stream and the control signals are optical pulses." Being able to modulate the amount of light reflected is necessary for potential industrial applications such as data transmission. "We can engineer the film to provide either a decrease or an increase in reflection, whatever is needed for the particular application," said Kinsey, working with a team of researchers led by Alexandra Boltasseva, an associate professor of electrical and computer engineering, and Vladimir M. Shalaev, scientific director of nanophotonics at Purdue's Birck Nanotechnology Center and a distinguished professor of electrical and computer engineering. "You can use either an increase or a decrease in the reflection to encode data. It just depends on what you are trying to do. This change in the reflection also results in a change in the transmission." Findings were detailed in a research paper appearing in July in the journal Optica, published by the Optical Society of America. The material has been shown to work in the near-infrared range of the spectrum, which is used in optical communications, and it is compatible with the complementary metal–oxide–semiconductor (CMOS) manufacturing process used to construct integrated circuits. Such a technology could bring devices that process high-speed optical communications. The researchers have proposed creating an "all optical plasmonic modulator using CMOS-compatible materials," or an optical transistor. In electronics, silicon-based transistors are critical building blocks that switch power and amplify signals. An optical transistor could perform a similar role for light instead of electricity, bringing far faster systems than now possible. The Optica paper, featured on the cover of the journal, was authored by Kinsey, graduate students Clayton DeVault and Jongbum Kim; visiting scholar Marcello Ferrera from Heriot-Watt University in Edinburgh, Scotland; Shalaev and Boltasseva. Exposing the material to a pulsing laser light causes electrons to move from one energy level called the valence band to a higher energy level called the conduction band. As the electrons move to the conduction band they leave behind "holes" in the valance band, and eventually the electrons recombine with these holes. The switching speed of transistors is limited by how fast it takes conventional semiconductors such as silicon to complete this cycle of light to be absorbed, excite electrons, produce holes and then recombine. "So what we would like to do is drastically speed this up," Kinsey said. This cycle takes about 350 femtoseconds to complete in the new AZO films, which is roughly 5,000 times faster than crystalline silicon and so fleeting that light travels only about 100 microns, or roughly the thickness of a sheet of paper, in that time. "We were surprised that it was this fast," Kinsey said. The increase in speed could translate into devices at least 10 times faster than conventional silicon-based electronics. The AZO films are said to be "Epsilon-near-zero," meaning the refractive index is near zero, a quality found normally in metals and new "metamaterials," which contain features, patterns or elements that enable unprecedented control of light by harnessing clouds of electrons called surface plasmons. Unlike natural materials, metamaterials are able to reduce the index of refraction to less than one or less than zero. Refraction occurs as electromagnetic waves, including light, bend when passing from one material into another. Each material has its own refraction index, which describes how much light will bend in that particular material and defines how much the speed of light slows down while passing through a material. The pulsing laser light changes the AZO's index of refraction, which, in turn, modulates the amount of reflection and could make higher performance possible. "If you are operating in the range where your refractive index is low then you can have an enhanced effect, so enhanced reflection change and enhanced transmission change," he said. The researchers "doped" zinc oxide with aluminum, meaning the zinc oxide is impregnated with aluminum atoms to alter the material's optical properties. Doping the zinc oxide causes it to behave like a metal at certain wavelengths and like a dielectric at other wavelengths. A new low-temperature fabrication process is critical to the material's properties and for its CMOS compatibility. "For industrial applications you can't go to really high fabrication temperatures because that damages underlying material on the chip or device," Kinsey said. "An interesting thing about these materials is that by changing factors like the processing temperature you can drastically change the properties of the films. They can be metallic or they can be very much dielectric." The AZO also makes it possible to "tune" the optical properties of metamaterials, an advance that could hasten their commercialization, Boltasseva said. More information: Epsilon-near-zero Al-doped ZnO for ultrafast switching at telecom wavelengths, Optica, 2015.